These are so very important and we try to live every day keeping these in mind and hopefully spreading them to others. We heard about the 100 Happy Days Initiative a few months ago, and surprise.. .it took us a while to get to it. It’s actually right up our alley, too, just take a look at our post on The Five-Minute Journal. But, The 100 Happy Days Foundation figured that would happen: “We live in times when super-busy schedules have become something to boast about. While the speed of life increases, there is less and less time to enjoy the moment that you are in. The ability to appreciate the moment, the environment and yourself in it, is the base for the bridge towards long term happiness of any human being. Being happy should be way up there in our priorities. Not only that, but acknowledging that happiness and being consciously grateful for it. Still with us? Good. 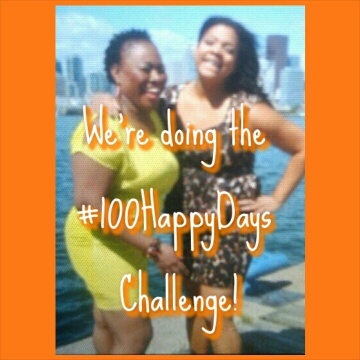 Because we are accepting the challenge to identify our happiness for 100 days. Every day we will both post a picture of something that made us happy. The foundation is clear that the 100 Happy Days challenge is not a happiness competition or a showing off contest. If you try to please/ make others jealous via your pictures- you lose without even starting. Makes perfect sense! People successfully completing the challenge claimed to start noticing what makes them happy every day, be in a better mood every day, realize how lucky they are to have the life they have and become more optimistic. If you support the 100 Happy Days Foundation with a donation of $15 USD or more, you can even receive a little book of your 100 happy moment. We will definitely be doing that at the end of our challenge. What a great little keepsake/reminder. Where will the moola go? Okay so, you know we’re in! If you want to see our happy pics, be sure to follow Chris (@chrisoftnl), Ash (@ash_tnl), and The Neon Leopard (@theneonleopardblog) as we will be posting our happy photos to Instagram daily for the next 100 days. We also challenge YOU to be a part of The Neon Leopard’s 100 Happy Days. Post your pics to Instagram, Facebook or Twitter. (Don’t forget to tag The Neon Leopard so we can see them) and add the hashtag #100HappyDays. We are looking forward to sharing and spreading happiness with all of you!